Posted on Sun, Dec 11, 2011 : 5:57 a.m.
Ypsilanti Township’s Burning Bush International Ministries is making plans to expand its new church even before moving in its congregation. 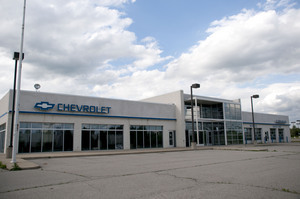 At its Tuesday night meeting, the Ypsilanti Township Board of Trustees unanimously approved a 1,900 square foot addition on to the existing 24,877 square foot former Carnahan Chevrolet dealership at 770 James L Hart Parkway. The new site of Burning Bush International Ministries is at the former Carnahan Chevrolet in Ypsilanti Township. With the addition, Burning Bush will be able to hold more than 900 people in its sanctuary. Church officials also received approval on Tuesday to begin relocating their offices to the new building, and they are hoping to have the congregation moved in by the end of the month. The addition will be in the part of the building that previously housed Carnahan's service bays that is being renovated into the church sanctuary. The church has grown significantly since the Rev. Don Shelby established it in his living room in Ypsilanti Township about 20 years ago. Burning Bush moved into its current Tyler Road location at the end of 2000, then rented the Willow Run High School auditorium as it continued expanding. It most recently moved back to the Tyler Road location as church leaders started saving money for purchasing the new building. Church leaders purchased the former car dealership, which was listed for $1.8 million, in June. Sun, Dec 11, 2011 : 2:29 p.m.
Say goodbye to that chunk of tax base! Sun, Dec 11, 2011 : 3:09 p.m.